The Morris River, known as the Scratching River in 1801, was the site of North West Company and XY Company fur-trading posts. Settlement began in 1874 where the trail from Pembina crossed the river, and the settlers were of British ancestry, mainly from Ontario. Both the town and the river were named after the Hon. Alexander Morris, Lieutenant-Governor of Manitoba from 1872 to 1877. The town was incorporated in 1883. To the west lies Lowe Farm, a village named for John Lowe, Deputy Minister of Agriculture, who owned and farmed a large tract of land there. 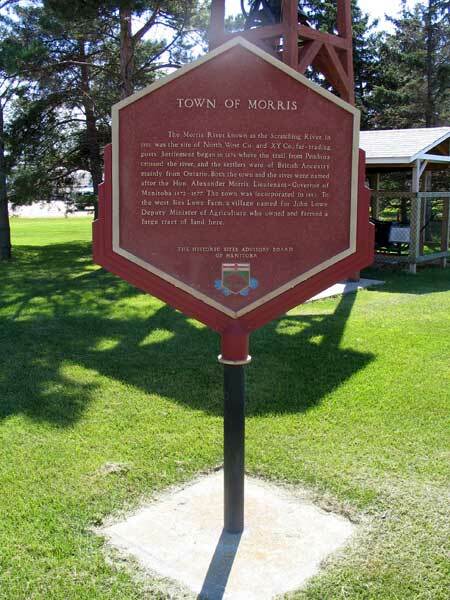 This monument was erected by the Historic Sites Advisory Board of Manitoba on the grounds of the Morris & District Centennial Museum.